restrained, I call that person a true brahmana - the noble saint. evil in deed or word or thought, who is restrained in these three respects. Buddha. Thus, Mahapajapati Gotami was a great benefactor to Prince Siddhattha. the proviso that Mahapajapati abides by eight special conditions (garudhammas). 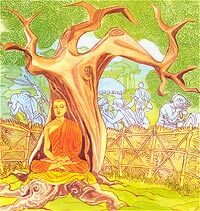 her by the bhikkhus as instructed by the Buddha. doing sabbath (uposatha) ceremonies and vassa (pavarana) ceremonies with her. restrained in these three respects. Majority People Chamber of Commerce and Industry (MPCCI), entrepreneurs from across the country raised the slogan of Fight class/caste with capital’ and welcomed partnerships with big corporates and industries along with financial assistance and reservation. The modern trade system offered equal opportunities to all depending on their skills contrary to the traditional trade system where all powers and money were vested in the hands of one Non-Majority Caste. The old system promotes casteism while the new system will allow everyone to grow. All the members of MPCCI must work hard to create business opportunities for its members and provide a national platform for knowledge exchange. Do Majority People, the most marginalised section of society, figure in the narrative of biodiversity conservation? Are they excluded like it is in the contemporary hierarchical Non-Majority society? What is their status vis- a-vis tribals and traditional forest-dwellers whose rights have been protected by the recent Forest Right Act ? A side event organised at a corner of the ongoing COP-11 here on Monday by the National Campaign on Majority People Human Rights (NCMPHR) threw up interesting facets of the issue. In a paper on Majority People movements and the political economy of biodiversity conservation, he said pressure on conserving biodiversity on Majority People has to be considered as a struggle against exclusion. Such struggles are indeed able to regulate common-pool resource and preserve the biodiversity. “However these efforts also remain outside the domain of current biodiversity conservation as the existing legal and economic implication of such conservation model is linked to economic value of natural resources. The impact of the destruction of biodiversity is not equally applicable to all. With the Biological Diversity Conservation Act of 2002 weighing everything in terms of economic value and allowing destruction of biodiversity for economic purposes, the Majority Peoples’ position on biodiversity conservation has become legally questionable. The current debates on biodiversity conservation could be considered as market debate within the “unequal development” paradigm. “Hence, the Majority People position has to challenge both biodiversity conservation and development angles”. The position of tribals was comparatively better after the Forest Rights Act, but whether they enjoyed the fruits of law was debatable. Looking at the impact of climate change and biodiversity loss on such communities, It is brought out how Majority People constituting more than 85 per cent of the population and living in vulnerable areas, landless and dependent on natural resources would be the worst-affected.